Six Steps to Pushing your Sight-Reading limits! Go the extra mile and improve your instantaneous musicianship. 1. Read duets with a friend or with your teacher (band director or Private Clarinet Teacher). Your friend will either be better or worse at music reading than you, this is your opportunity to read up a level or help explain rhythms to someone. This might be your first teaching experience. Explaining music to people helps you become a better musician and gives you a little more respect for your teachers. Also, as you sight-read the duet, scan up or down at your partner’s line of music. Are you together? If you get off-track, can you get back on-track by scanning the other part. This ensemble technique will help you keep up with an advanced player and guide a less advanced player. In Europe, Solfege is taught at very young ages and gives these young people a great advantage to learning music. Many U.S. musicians never see solfege or are made to take sight-singing until they go to music school or conservatory. If you wish to have a sight-reading “leg-up” on your competition, study sight-singing. Hearing the music before you play it is an admirable, musical technique. 3. Read outside your style. Try some Jazz. Attempt to read with a swing. Notice all of the syncopated rhythms. Moving outside of your comfort level will expose you to more musical cultures and give you a rock-solid formation when returning to your standard studies. 4. Find odd meters and rhythms to read. 5/8, 7/8, 9/8, 5/4, 10/4, etc… are all examples of odd time signatures. Standard music is set-up with duple and triple patterns and sixteenth patterns that are in fours or sixes (like groups of four or six sixteenth notes). When searching for odd rhythms, look for sixteenth patterns of fives, sevens, tens and really quick alterations between duple and triple patterns. Sight-reading difficult rhythms will give you yet another advantage over your competition. Take your musical knowledge to an extra level. Try to read simple melodies up a half-step or whole step. Then, read as written. Transposition is another way to get to know your key signatures and how melodies feel in all of the keys. One exercise jazz players use all of the time is to play a musical “lick” through all of the keys. Yes, take a small musical figure and transpose up a half-step, then do it again up another half-step, then again all the way through the 12 major (or minor) key signatures. This exercise also improves your ear, eye and finger coordination. How does transposition help you? You can read any piano score on clarinet, and any popular music tune you wish to play with piano or guitar (without buying a special clarinet book). Also, if you are interested in orchestral clarinet playing, many scores are written for the clarinet Bb, C and A. Transposing to and from each of those written clarinet parts is a hot commodity in professional clarinet circles. 6. Sight-read outside your own clef. Clarinetists read in treble clef, right? So, go and learn bass clef. Go find a church hymn book. Does it have four part harmony? Start reading bass clef here where the hymns are very simple. Then advance to piano scores, orchestral scores or Bach cellos sonatas/suites. Reading outside your normal clef will make you much more comfortable when you return to treble clef. Now, try tenor and alto clefs. 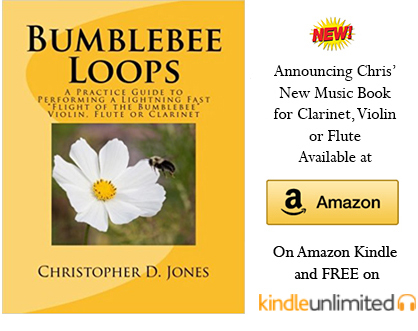 Go to Clarinet Sheet Music to find great places to find free printable clarinet music, free previews of copyrighted music and free music right under your nose.